Scroll through the list of field names and click to check or uncheck the boxes next to the field names to select or deselect them. 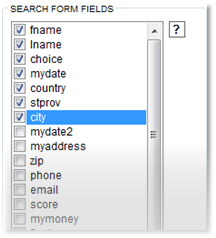 To change the order of the fields as they appear on the Search Form, hold the control (CTRL) key down and use your mouse to click and drag items in the list. Specify which fields you'd like to be used on the Search Form allowing the user to specify both a minimum and maximum value to be used in the search. NOTE: only those fields that were chosen on the search form and are of type numeric or date will show up as possible search ranges. 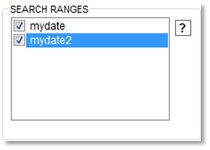 If the search range box is empty then there were no numeric or date type fields chosen for the search form. Chosen fields selected for the search form can have options to allow for search's based on "ANY WORD", "ALL WORDS", or "EXACT PHRASE ". By default Data Asap will search for words that are LIKE the one the user has entered. For example when the user puts John then they will also get results that have the word John in them like Johnston. By using the Search Options selection for the same field the user will have the ability to choose from "EXACT PHRASE" which will yield only results with the word John in them. The "ALL WORDS" option has the unique capability to search for several words that you type in separated by a space. For example if you were to type John and then Jones you would get search results for John, Johnston, Jones.